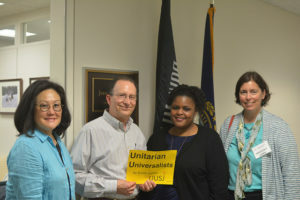 On Tuesday, May 8, seventeen UUs for Social Justice (UUSJ) Capitol Hill Advocacy Corps (AC) members went to 50 Senate offices on the RECLAIM Act and delivered 550 letters and our message in support of environmental reclamation and sustainable economic development in communities shifting away from a dependence on coal production. In addition to the eight scheduled meetings, a number of additional meetings resulted from drop-in visits. We’re still figuring out how many based on reports still being filed. 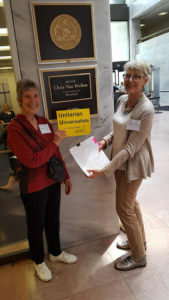 Letters that we had in-hand and delivered on May 8, came from 15 states representing 19 congregations to date (plus three people who sent letters as individuals not part of a congregational WHWN effort). We also received letters from KY and a congregation in MN will conduct their letter-writing on May 20, bringing totals to 17 states, and 23 congregations. On the whole, we learned more about the status of the RECLAIM Act and the politics behind why it’s not moving. Many staffers were not familiar with the bill. At this point, Republicans are blocking the bill’s movement forward. There is the possibility of action on this after Election Day, but this likely depends on election results. There are efforts to get Speaker Ryan to put it on the House bill on the calendar for a vote, and the closer we get to the mid-term elections, the less likely that is to happen. 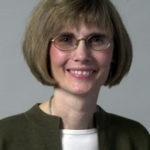 In addition to the East-West divide based on certified and non-certified status (which Senator Manchin’s staff thinks has been addressed and should be less of an issue now), and differences in mining reclamation needs, there is the unwillingness of Congressional leaders to “give Senator Manchin a win,” and the GOP effort to defeat Senator Manchin in November. He is the original sponsor of the RECLAIM Act (first introduced in December 2016, working in concert with Obama White House staff). Appalachian Voices and others in the coalition of regional and community organizations appreciate our effort on the RECLAIM Act. We’ll keep watching it and hope for progress.